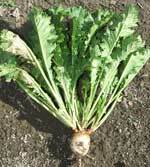 Appin forage turnip was bred for fast, vigorous establishment and quick maturity (60-100 days). It is firmly anchored in the ground for minimum wastage. Appin has a significantly higher proportion of leaf yield compared to other turnips, and is multi-crowned for improved re-growth potential. The high leaf-to-bulb ratio results in a very leafy crop with high digestibility. Sow Appin at 1-3 lbs. per acre. Plant at 1/4" to 1/2" deep. Seed can be no-tilled into suppressed sod or seeded into a conventionally prepared seedbed. If tillage is conducted, let the first flush of weeds germinate, then till the field one more time to control weeds. After final tillage pass, firm soil with culti-packer, then either drill or broadcast seed. Following seeding, culti-pack field once more to improve seed-to-soil contact. For extended grazing, plant in early to mid-summer (depending on climate). For summer grazing, plant in the spring after soil warms to 50F. Follow soil test recommendations. Nitrogen: If not using manure, apply 75lb/A nitrogen at seeding followed by additional 50-70 lbs/A after first grazing. Turnip leaves have very high energy and low fiber. Nitrate testing is advised for high fertility scenarios. Protein content is determined mostly by nitrogen fertility. - Start by grazing for no more than 1-2 hours per day. Slowly increase to a maximum intake over at least 7-10 days to allow rumen to adjust. 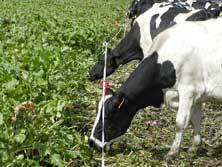 - Feed extra fiber during grazing and allow access to grass pasture. - Consult with your nutritionist to ensure ration is balanced. - Do not overgraze if planning multiple grazings.